My dog's skin has always been itchy and every summer he has to be treated. After a recent series of tests and I was told that he has flea allergy dermatitis. The problem is that I have never seen a flea on him. Is this diagnosis correct? In an allergic reaction, the immune system overreacts and produces antibodies to a substance that it would normally tolerate. 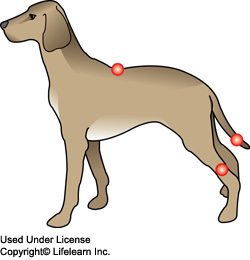 Flea allergy dermatitis (FAD) is the leading cause of itching in dogs. 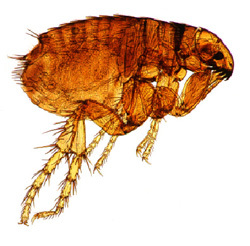 Adult fleas require a blood meal in order to reproduce. However, they do not usually remain on the dog except when they are feeding. When they feed, they inject a small amount of saliva into the skin. Proteins in the saliva cause an intensely itchy response to sensitive dogs. "A single fleabite can cause itching for days." Dogs with FAD do not have to be infested with fleas to be itchy. In fact, a single fleabite can cause itching for days. FAD can affect any adult dog although some breeds appear to be more prone than others are. Clinical signs often give the first clue that your pet may suffer from FAD. 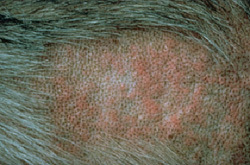 Itching and hair loss in the region from the middle of the back to the tail base and down the rear legs (the "flea triangle") is often associated with FAD. Intradermal allergy tests (skin tests) or specialized blood tests (IgE blood tests) can confirm flea allergy in your dog. "Since the injection of flea saliva causes the allergic response, it is important to prevent fleas from biting your dog." Desensitization or administering "allergy injections" involves injecting increasing doses of a diluted flea antigen over a prolonged period. In some cases, these allergy injections may be required for the pet's life. Desensitization therapy is successful in approximately half of FAD cases. Corticosteroids, "cortisone" or "steroids" are widely used to treat FAD. They often bring about miraculous relief from the itching. However, there are significant potential side effects to steroid use. The long-term use of corticosteroids can ultimately result in more harm than good. Steroids can be safely used for short-term relief while flea control is being implemented. Combining corticosteroids with antihistamines and/or Omega fatty acid supplements is an ideal regimen for many patients. The goal is to use the lowest dosage of corticosteroids as possible, as infrequently as possible, preferably on an alternating-day basis. If your dog has developed a secondary bacterial skin infection because of the scratching, antibiotics may also be necessary. Your veterinarian will discuss the pros and cons of the various treatments for FAD with you during the examination, and will recommend the safest and most effective treatment plan for your pet's individual needs.